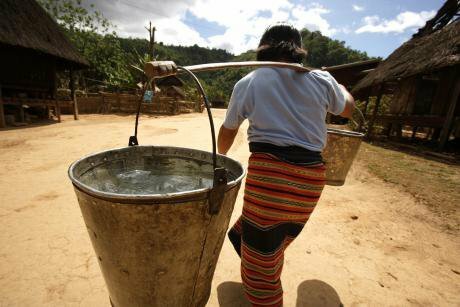 Image: Woman carrying water from standpipe in Lao. Credit: Jim Holmes/AUSAid/Flickr, CC 2.0. A new report by Oxfam suggests that a generation of reckless financial deregulation, wealth accumulation by the world’s richest one percent and the rolling back of essential State services has resulted in extreme levels of social and economic polarisation. The report headline is that in the decade since the 2008 global financial crisis the number of billionaires has nearly doubled and their wealth has increased by $900bn in the last year alone, or $2.5bn a day. In the same period, the wealth of the poorest half of humanity, 3.8 billion people, has fallen by 11%. Put another way, this means that just 26 billionaires – down from 43 in 2017 - own the same wealth as the poorest half of humanity. To quantify this wealth in development terms, the report says that Jeff Bezos, owner of Amazon, has amassed a fortune of $112 billion. Just 1% of this sum equates to the entire health budget of Ethiopia. In summary, rich and poor are becoming increasingly polarised and wealth is concentrating in fewer hands. Oxfam argues that one of the main reasons for this grotesque distortion of wealth distribution is the under-taxing of the super-rich who, it suggests, are secreting a sum in the region of $7.6 trillion off-shore. The report argues for ‘a new set of global rules and institutions to fundamentally redesign the tax system to make it fair’. But tax avoidance is just one factor underpinning inequality that is captured in Oxfam’s report; two other significant drivers of poverty are gender discrimination and the erosion of public services. Globally, women earn 23% less than men and in the United States single white men own one hundred times more wealth than single Hispanic women. Oxfam argues that where the poverty gap is greater between rich and poor so is the level of inequality between men and women. The report calculates that if all the unpaid work carried out by women and girls everyday such as caring, cooking and cleaning, was delivered by a single company, it would have an annual turnover of $10 trillion. That would represent a turnover 43 times greater than that of multinational giant Apple – but goes undocumented in the development indices and reportage of most multilateral development organisations that rely on the blunt economic instrument of Gross Domestic Product. What is also largely ignored is the stolen time from women, particularly on low incomes, who are denied opportunities to take-up education, political and economic opportunities that would support both individual and community development. Investment in public services not only narrows the gender poverty gap but enhances the development prospects of communities on the coalface of neoliberalism in the global North and South. Health, education and social protection are identified by Oxfam as critical to overcoming the barriers to inequality and enlarging the life opportunities for the millions of people on low incomes. Today nearly half of the world’s people (3.4 billion) live on less than $5.50 day while the wealthy are persistently under-taxed. Just 4 cents in every dollar of tax revenue comes from the rich and in some countries, including the UK and Brazil, the poorest 10% are paying proportionately as much tax as the richest 10%. This situation is untenable as increasing numbers of the working poor are forced into poverty. As the UN Rapporteur’s report on austerity in the UK made clear last year, the decade following the 2008 financial crisis has been characterised by increasing poverty in the global North. For example, the Trussell Trust distributed 1.3 million three-day emergency food supplies in the UK to people in crisis between April 2017 and March 2018, a 13 per cent increase on 2017, with 484,026 of these supplies going to children. Our economy is broken, and Oxfam urges a realignment of taxes to ensure the wealthy pay their way. The report calculates that a modest 0.5% tax rise on the income of the richest 1% would raise sufficient revenue to educate all 262 million children currently out of school and provide healthcare for 3.3 million people. Sustainable Development Goals – riven with contradictions? There are significant doubts, therefore, as to whether the SDGs can bridge the current poverty gap while working within the same old tried and failed neoliberal economic model. There have been no indications to date that the wealthiest one percent is interested in more proportionate and fair tax contributions; that goes against their neoliberal grain. Oxfam make three sensible key recommendations based on the evidence of their report. First, the delivery of “free universal healthcare, education and other public services that also work for women and girls”. Easier said than done – but made more possible with the implementation of the second recommendation to “end the under-taxation of rich individuals and corporations” which could potentially liberate billions more in revenue for the public purse. And, thirdly, to ease the millions of unpaid hours that women spend “caring for their families and homes”.